Thanks to overwhelming interest in our event, we have reached maximum capacity for our facility and have had to stop accepting new registrations for the 2019 Innovations in Global Health conference. We still have room for those who would like to hear a presentation from Dr. Kathleen Sienko, about her work at the University of Michigan, on Friday, February 22nd at 4:15 PM in the Clinical Health Sciences Center at RIT in room 78-1530, the Physician Assistant program teaching lab. 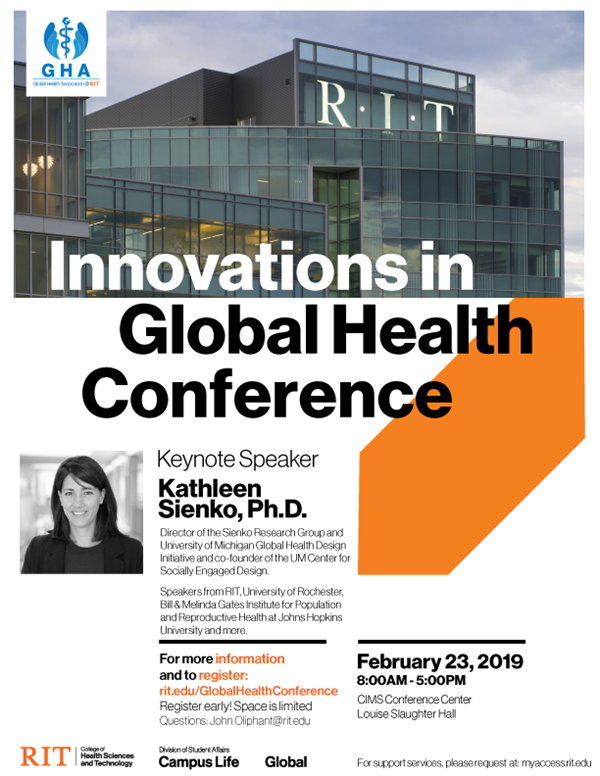 Everyone is also welcome to join us for our Global Health Association @ RIT March event featuring Sarah Brownell and our April event featuring Jim Sutton. Sarah Brownell is a lecturer in Design, Development and Manufacturing and the Director of the Grand Challenge Scholars Program at RIT. She co-founded the non-profit organization Sustainable Organic Integrated Livelihoods (SOIL) and lived in Haiti for four years before coming to RIT working with SOIL and other non-profit organizations. Sarah’s presentation will focus on sustainable sanitation while also discussing composting, improving subsistence agriculture, water disinfection, human centered design and popular education. Please join us for this event held by the Global Health Association @ RIT on March 21st at 6PM in the Carlson Building Room 1155. Jim Sutton is a certified Physician Assistant at Rochester Regional Health and the Executive Director of the Society of Refugee Healthcare Providers. With his expertise in refugee health, Jim will discuss how refugee settlement effects Rochester and how care is structured to meet their healthcare needs.describe opportunities on how all people can get involved. He will also discuss his opinion on what is being done by medical providers on a national level in response to refugee resettlement in the U.S. and will describe the current political environment that has led to decreased resettlement over the last 2 years. This event will take place on April 11th at 6:00 PM in the Carlson Building at RIT in Room 1155. Please join The Global Health Association @ RIT in hosting Jim Sutton to learn about an important topic that directly impacts our community.